3.9 9.23 Do You Believe in Miracles? 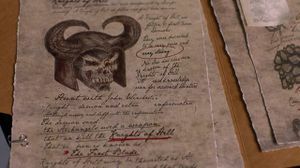 Manuscript page detailing the Knights of Hell. The Knights of Hell are demons who were handpicked by Lucifer from among the first fallen humans to be made into demons, the first of which was Cain, who in turn trained the Knights and built the entire order with his own hands. They were created after the first demons Lilith and Alastair and the Princes of Hell. The Knights of Hell operated for centuries, bringing darkness and chaos everywhere they went. The Knights were rumored to have all been killed by the archangels, though one survived – Abaddon. Its eventually revealed that Cain was the one who wiped them out, killing them in revenge for the kidnapping and death of his wife, but left Abaddon alone as his wife made him promise to stop his ways. Abaddon was then sent by parties unknown to kill the Men of Letters in 1958, after she travels through time in pursuit of Henry Winchester and the box to 2013, she is trapped inside her meatsuit and buried. Abaddon escapes after Sam and Dean exhume and reconstruct her body, and try to use her for the third trial to close the Gates of Hell. She later tries to kill Crowley so she can take over Hell, but Sam douses her in holy oil burning her meatsuit, and forcing her to vacate the body. She later has the body of Josie Sands restored and starts a crusade to take over Hell and Earth. Using the First Blade along with powers granted by the Mark of Cain, Dean kills Abaddon, leaving Cain as the only Knight remaining until the Mark of Cain transforms him into one. Sam eventually captures Dean and administers the demon cure in the Men of Letters Bunker. After once again falling under the Mark's influence, Cain, believing that his bloodline is tainted by his past actions, begins to target his descendants. Eventually, Dean kills Cain too, leaving the Knights extinct. Knights of Hell, being some of the first fallen human souls, are more powerful than standard black-eyed demons. While they also appear have the powers of normal demons, as well as abilities and powers far beyond that of any other demons, as shown by Abaddon imparting part of her demon essence into a victim to see their memories. Like run-of-the-mill demons, however, they are susceptible to devil's traps, holy water and holy fire. They are resistant, however, to demon-killing knives, though being stabbed with one can cause temporary pain and discomfort. The only known weapon that is able to kill a Knight of Hell is the First Blade. Exorcism - Abaddon showed the ability to exorcise a demon with a single touch. Invulnerability - Knights of Hell were shown to be resistant to the demon-killing knife. In Abaddon's case however, the knife still appears to cause intense pain for a brief period. Possession - Like all demons, Knights are capable of possessing humans. The Knight of Hell Abaddon also showed the ability to imbue a portion of her demonic smoke into a human in order to read their thoughts. Super strength - Knights of Hell possessed strength that exceeded that of humans, demons and possibly angels. Devil's trap - A devil's trap has the ability to hold and render a Knight of Hell powerless. Cain, however showed a level of immunity, still retaining his strength and telekinesis, as well as claiming that the trap would not hold him for long. The First Blade - The only known weapon capable of killing a Knight of Hell, when working in conjunction with Mark of Cain. Holy fire - Can damage / destroy a Knights' meatsuit, forcing them to escape into a new one. Holy water - Holy water is capable of hurting a Knight like other demons. 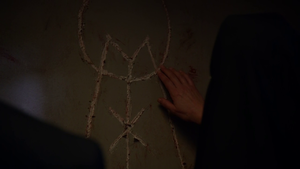 Mark of Cain - People who bear the Mark are immune to the powers of a Knight when they also wield the First Blade, as shown when Dean was able to not be affected by Abaddon's attempted use of telekinesis on him while in possession of the First Blade. The crest of the Knights of Hell. In the 1950s, Abaddon possesses Men of Letters iniatite Josie Sands, to get access to the Men of Letters in order to steal the box under the orders of an unknown party. She kills all but Larry Ganem and Henry Winchester who escapes through time with the box. Abaddon is able to follow Henry through time and easily throws Sam and Dean around. Dean manages to stab her with Ruby's knife which hurts her, but Abaddon proves immune to being killed by it. Abaddon reads the memories of the motel clerk to learn what he knows about Sam and Dean and then kills him. Abaddon travels to Astro Comics - which was orginally the Men of Letters headquarters. She reads the Clerk's mind what she knows,and kills her. Using the clerk's memories, Abaddon tracks down Larry Ganem and apparently disguises herself as or possesses his wife and listens as Sam arrives and learns about the storehouse that the box opens and gets the coordinates to it. Abaddon kills Larry and knocks Sam out. She then calls Dean and demands that he trade Henry and the box for Sam's life which he agrees to. At an old processing plant, they make the trade, but Abaddon goes back on their deal, trapping Sam and Dean and fatally wounds Henry. Unknown to her, they expected her betrayal. Henry shoots Abaddon in the head with a bullet engraved with a devil's trap though Abaddon doesn't realize what he has done at first. Abaddon is angered to discover that the box she was given is a fake and demands to know where the real one is. When no one tells her, Abaddon tries to read Henry's memories and discovers that she is unable to impart her essence into him as well as unable to move her legs. Realizing what happened, Abaddon points out that they still haven't killed her, but Dean tells her that she will wish they did and cuts her head off. Dean explains that with a devil's trap bullet in her head, Abaddon is bound forever to her meatsuit so they will cut her into small pieces and bury them in cement, forever entombing Abaddon and defeating her. 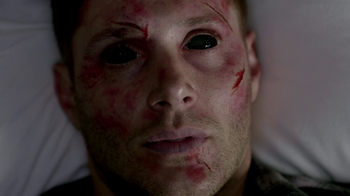 After Sam and Dean find a way to cure a demon, they recover Abaddon's body parts and sew her back together. When she reanimates, she tries to release her demonic form from the body but is unable as she is still confined due to the devil's trap bullet inside her meatsuit's head. She also realizes that her hands have been cut off and placed in a box next to her; a precaution from Sam and Dean. Realizing that she won't be able to escpae, she tells Sam and Dean about her involvement in Father Max Thompson's murder after word got out about his experiments on demons. This lead her to find out information about Josie Sands and the Men of Letters. When Sam receives a phone call from Crowley, Dean explains to her that Crowley is the new King of Hell, which shocks her and angers her and they both leave Abaddon unattended to answer it. Abaddon then uses the opportunity to escape by forcing her hands to remove the bullet from her head which allows her to use her powers to vanish. After Crowley calls for help, Abaddon arrives, breaks the devil's trap holding him, disarms Sam and overpowers him. However, Abaddon is not there to save Crowley and is enraged to find that Crowley is the ruler of Hell in 2013. Abaddon mercilessly attacks Crowley and tells him they need to talk about a regime change, but at that moment Sam returns and douses her in holy oil before setting her on fire. Abaddon writhes in pain and is forced to leave Josie Sands and escapes in her smoke form. Abaddon has a demon loyal to her perform a ritual to restore Josie Sands' body to use as her meatsuit once more. Abaddon then gathers a group of four demons and announces her plans to take over Hell and the world, saying that Crowley is not fit to lead as all he does is make deals for things they should take by force. When a crossroads demon among the group questions her, Abaddon exorcises her, telling her to warn all the demons in Hell that she is coming. Pretending to be a bus driver, Abaddon helps her demons get better meatsuits by possessing soldiers from a military base. She then kidnaps Irv Franklin and forces him through torture to tell her where to find other hunters and captures Tracy Bell as well. Calling one of Dean's numbers, she gets Kevin Tran and has him pass on a message with her location to lead the Winchesters into a trap. Finding Dean and a freed Tracy, Abaddon confronts them and avoids being taken down with devil's trap bullets once more by wearing a bullet-proof vest. Dean distracts her with holy water, allowing Tracy to go get the Impala while he confronts Abaddon with an angel blade. Abaddon disarms Dean and offers him a deal: tell her where to find Crowley and she will kill him quickly, refuse and she will rip off his anti-possession tattoo, possess him and force him to watch her commit horrors. Abaddon is shocked when Ezekiel reveals his true form nearby and flees after learning that Sam and Dean brought an angel with them to confront her. Crowley uses a goblet of blood to contact Abaddon who is amused by his call. Abaddon reveals that she has gone back on all of the deals Crowley has made and collected the souls early, doubling the amount of souls in Hell. She is also reshaping Hell to be more chaotic and claims that since Crowley has disappeared, he doesn't have much support left. When Crowley warns her that a chaotic Hell won't work and she will burn, Abaddon says she's looking forward to it and hangs up on him. A demon who has seen Crowley with Dean and Castiel contacts Abaddon with a goblet of blood to let her know. Abaddon is alerted by Cecily to the fact that Crowley visited her. Cecily lets her know what Crowley wanted and where he went, but Abaddon is furious to learn that Cecily is playing both sides, and kills her with an angel blade. Tracking down Crowley with two minions, Abaddon confronts him in a warehouse and orders her minions to kill him. 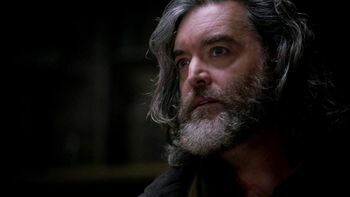 However, they hesitate and Crowley tells them he sympathizes with them, for having turned to Abaddon for leadership when he disappeared but that he is back. He tells Abaddon that the struggle for the crown of Hell is not a fight, but an election between the demons loyal on either side of the struggle. He leaves after telling them to spread the word. This page was last edited on 9 April 2019, at 01:39.